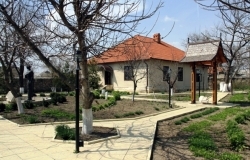 About 95 kilometers from Chisinau in the village of Zaim there is a house-museum of Alexei Mateevici. Being an eminent poet and writer he contributed immensely to the development of Moldavian culture; he is the author of the anthem of the Republic of Moldova "Limba Noastra". This section is devoted to the project of Moldovan Orthodox churches, their difficult history and the changes they have undergone over the years of their existence. Chapel of "All Saints glorified Moldovan land"
Church "Purification of Our Lord Jesus Christ"
The old church "Purification of Our Lord Jesus Christ" was built in 1879-1880 years. Church in the name of "Holy Apostle and Evangelist Luke"
Church of "the Holy Image of Christ"
Church of St. Michael the Archangel was built in 1779 and is possibly the oldest church in Moldova. Nature Monument "Rapids of the Prut River"
The village of Coban is located 200 km from Chisinau. According to recently found historical documents this place is..